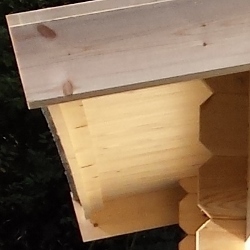 We design your log cabin to have larger roof overhangs at the front, back and sides. This provides extra protection from the elements and can help to reduce issues caused by weathering, water ingress and splash back. You will need to leave extra space around the sides and back of your log cabin to fit in the roof overhangs. We know that in some cases it might limit the size of the building that you can fit in your garden but it is an important factor and so as a rule we don’t reduce the roof overhangs.